Himalayan salt lamps, made from large pieces of pink rock salt from Pakistan, may have more benefits than just offering a pretty quality of light or looking nice. It's possible they also can affect mental, physical, emotional, and spiritual health. What's so Special About a Salt Lamp? Manufacturers of the salt lamps suggest when the lamps are turned on, the gentle heat from the light bulb and the absorption of moisture in the air causes the release of negative ions through an evaporative process. Alternatively, Himalayan salt lamp benefits research suggests there is no scientific evidence proving the salt lamps release negative ions or have any effect on health. However, the lack of scientific proof about the efficacy of salt lamps hasn't kept them from becoming a highly sought after item to help support mental, emotional, spiritual, and physical health. People in metaphysical and energy healing circles tout numerous benefits, mostly based on their supposed release of negative ions. One of the most widely reported benefits of the salt lamps is that spending time in their presence boosts serotonin, which promotes better sleep. And while this is an unproven result, anecdotal reports suggest users do feel they sleep better when using the lamps. This may be true not because of the release of negative ions, but because the lamps emit a soft and relaxing glow that helps to set the body's circadian rhythms to "sleep." Want to try it? Go screenless (no phones, computers, television, or other backlit LEDs) and curl up with a cup of herbal tea by the light of a Himalayan salt lamp for 30 minutes to an hour before bed. Some people swear by Himalayan salt lamps to help soothe and reduce their anxiety. Why? It's those (unproven) negative ions again and their effect on serotonin. They are also believed to increase blood flow to the brain, which may also help reduce anxiety. One of the biggest claims about Himalayan salt lamps is they purify air, both through the release of negative ions and the hygroscopic nature of salt, which means it attracts moisture particles from the air. For this reason, many people place Himalayan salt lamps near computers and electronics to clean electromagnetic energy or have them in areas where they spend a lot of time to absorb toxins and allergens. 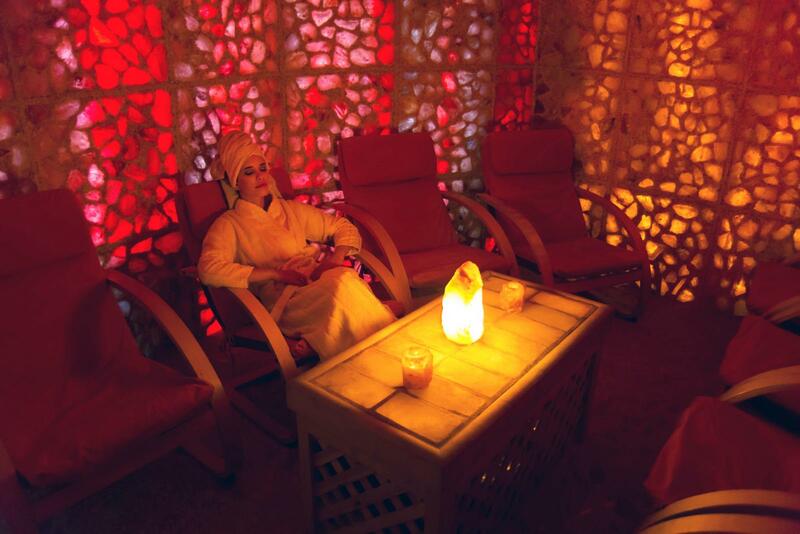 The pink salt used to make the lamps is a type of healing crystal called halite. Halite is believed to have numerous healing properties, such as purifying the aura, cleansing negative energy, and cleansing other crystals. In feng shui, Himalayan salt lamps are believed to draw sha chi (negative energy) from spaces and objects and to help balance yin and yang. Even without scientific evidence, people have attributed multiple benefits to Himalayan salt lamps. Do Himalayan pink salt lamps work to do all of these things? It depends on who you ask. So far, the scientific community says evidence is inconclusive or just not there, while anecdotal reports suggest salt lamps do all of these things and more. The lamps are affordable and won't hurt you. So if you want to test their benefits for yourself, buy one and put it somewhere you spend a lot of time. Then, you can decide if there are benefits for you, or if it's all hype.